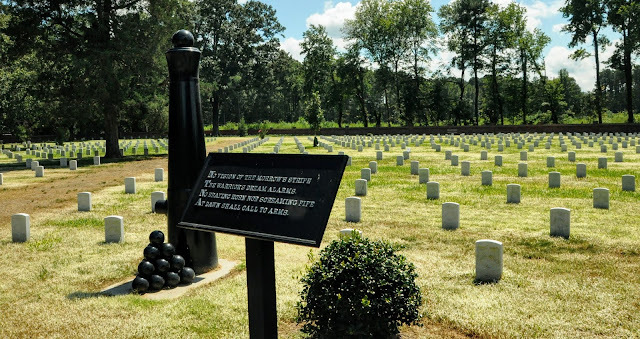 If you visit Petersburg National Battlefield to learn about the Battle of the Crater, then you should take some time to visit two local cemeteries, Poplar Grove National Cemetery and Blandford Cemetery, as the young men on both sides who fought and died in that battle (as well as others in the area) are interred there. The Civil War was the inception of the National Cemetery system in the U.S. Poplar Grove National Cemetery is managed as part of the Petersburg National Battlefield. In July 1862, Congress passed legislation giving the President the authority to purchase land to establish cemeteries "for the soldiers who shall die in the service of their country." At Petersburg, the implemention of this system didn't begin until 1866. During the Siege of Petersburg, Union soldiers who were killed in battle were hastily buried pretty much where they fell, some in single, shallow pits, but others in mass graves. If there was any identification, it usually was simply a name carved on a wooden board. But usually there wasn't even time to do that much. Some units, such as the IX Corps, had small cemeteries near their field hospitals for soldiers who died in their care. Thus, in 1866, Lt. Colonel James Moore began surveying the Petersburg region to find land for a cemetery. Eventually, a farm just south of the city was chosen. This tract of land had been the campground for the 50th New York Volunteer Engineers; during the war they'd constructed a Gothic Revival pine-log church called Poplar Grove. Once the cemetery was established, work began to move approximately 5,000 Union soldiers from nearly 100 separate burial sites around Petersburg. Bodies were removed from nine Virginia counties, reaching as far rest as Lynchburg. With 10 army wagons, 40 mules, and 12 saddle horses, the 100 men of the "burial corps" began their search and recovery mission. They would march in a line a yard apart, each examining a half yard on both sides as they proceeded. They would search whole battlefields with this method; when a grave was found, the entire line halted until the teams came up and removed the remains. Many graves were marked with stakes, but some were discovered only by the disturbed appearance of the ground. Bodies that had been buried in trenches were barely decomposed; those buried singly in boxes often only were bones and dust. Remains were placed in plain wooden coffins; headboards, if there was one, were attached to the respective coffin. It took the burial corps three years to gather all the remains, but by 1869, they'd recovered and re-interred 6718 remains, of which only 2139 bodies were positively identified. 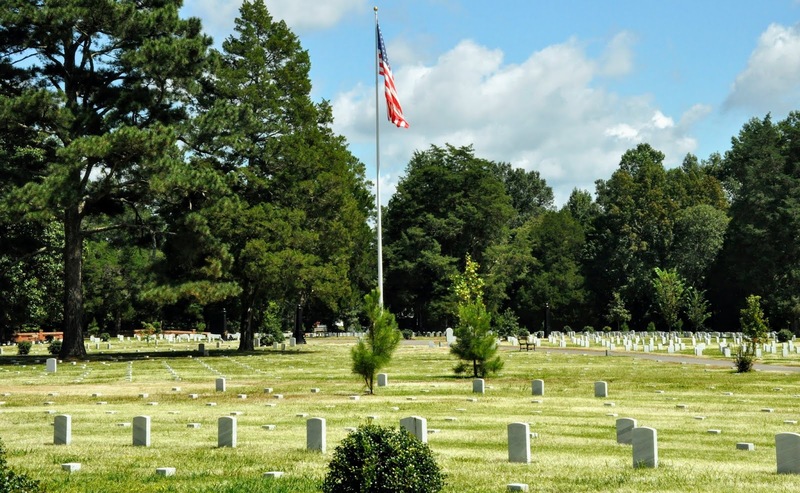 Getting there: Google Poplar Grove National Cemetery on Google Maps or your GPS. 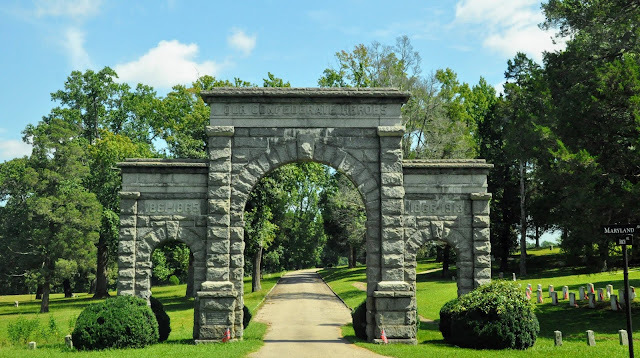 Blandford is a historic cemetery where Confederate soldiers were buried -- some 30,000 of the Confederate soldiers killed in the Siege of Petersburg were buried there. Located on Memorial Hill, which is a mass grave consisiting of 30,000 interrments. Similar to Union casualties, of those, only about 3700 names are known. The cemetery's gravestones, sculptures, and tombs represent a diverse array of 18th, 19th, and 20th century styles of funerary art. While you're there, check out the Blandford Church, which played a significant role in Civil War Petersburg. Beginning in May 1862 the church served as a major telegraph station. During the Siege of Petersburg from June 15, 1864 to April 2, 1865 Blandford Church was hit by three shells. Its major use during the siege was as a hospital, most notably after the Battle of the Crater on July 30, 1864.